American/European strawberry cultivars are morphologically different from Asian cultivars with American cultivars generally having higher yields, fruit weight, and fruit hardness and Asian cultivars tending to have higher sugar content. In this study, we performed backcrossing to improve the fruit qualities of Asian varieties of strawberries using American cultivars as the donor parent. The F1 progeny derived from crosses between Asian and American cultivars tended to have lower sugar content and higher fruit weight and yield than Asian cultivars, but fruit hardness did not differ between the Asian cultivars and the progenies. The percent germination and survival ratio were not significantly different between the BC1F1 and BC2F1 generations, whereas the percent germination decreased rapidly with advancing backcross generations. The BC1F1 generation had slightly higher sugar content and the sugar content of the BC2F1 generation increased significantly over the BC1F1 generation, but fruit weight and yield decreased. However, there was variability among individual progeny from the same cross. With advancing generations of backcrossing (BC3F1, BC4F1, BC5F1), sugar content tended to improve while fruit weight and yield tended to decrease, and hardness tended not to change. 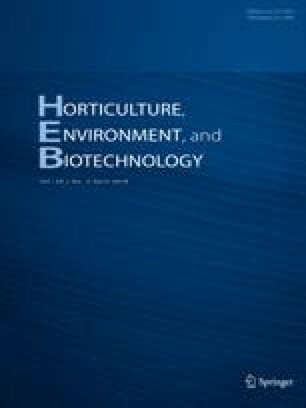 Therefore, to develop new cultivars with the combined qualities of Asian and American cultivars, we concluded that generations beyond the BC2F1 are not necessary, and that the selection efficiency of superior individual plants can be improved if the number of seedlings is increased in generations before the BC1F1 or BC2F1. This work was supported by grant No. PJ010911 from the Agricultural R&D, Rural Development Administration, Republic of Korea.